I cut the base to stand upright and it has a little overhang with a partial cave to it. Still doing hot water soaks in a 5 gallon bucket to leech out the tannins. Also am looking for at least one large plant to add. I have the Marineland bamboo that Ive modified with a weighted base that might be one idea or Ive have some other stuff packed away. I have a yard full of rocks but nothing really speaks to me to add to the tank. Might need to go out in nature and find something cool. Thats the only real update at the moment. Just placed order for my plastic plants. 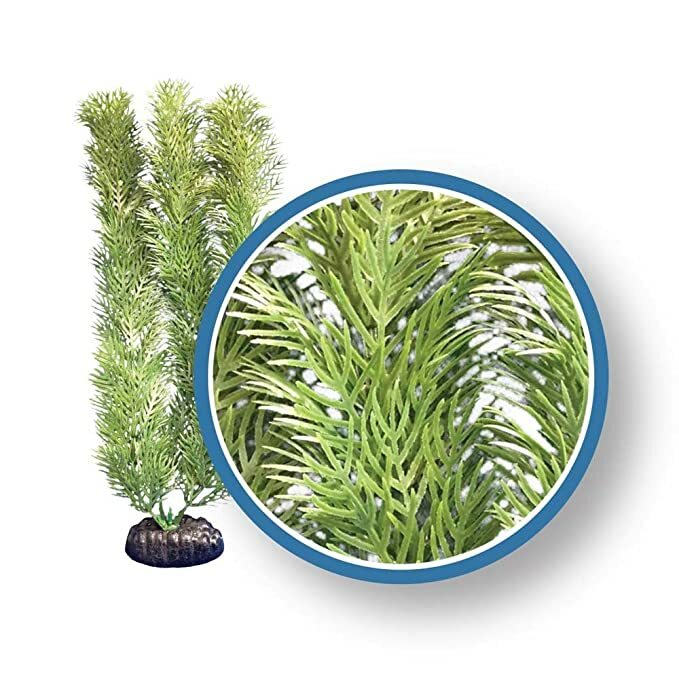 I love the WECO freshwater pro series of plants. They go up to 30” and are pretty realistic compared to other brands. They also last. Ive been using the same ones in my 300 gallon for a couple years now and no fading at all. The only issue is they come off the base so if you silicone them in they just seem to last. I went with an 18” and 12” cabomba, should fill in the tank nicely. Ialso have some Seagarden plants that are at least 5 years old that I use that look pretty good too. Still need to get a few more large rock and then the new aquascape reveal. Been doing some thinking about filtration. Currently the 65B is taken care of by an Aquaclear 110 and I do regular water changes. The Suvattii seems to be doing very well and Im having no issues. Even at full growth with the water volume and that filter, it should be more than adequate? Im asking because my hairy puffer is full grown, has the exact same set up and has an additional Eheim 2217 canister on the tank. Im feeling like its overkill and I could use that filter for a different project or sell it to get something else. Anyway just looking for thoughts on that. It is overkill. Imho you could take it off. Thanks, was thinking the same just need a second thought on things every now and then. Need to update pics but I will say the Suvattii is very responsive to me. I ran out of worms so I went through stuff in the freezer. Well this thing seems to eat anything. Frozen krill, squid, tilipia, shrimp, razor clam meat. Apparently not picky at all. A nice change of pace compared to my hairy puffer that has to ‘inspect’ everything forever before it decides to eat. My Hairy will ONLY eat live earthworms. Mine loves worms and live shore crabs. It will eat krill but for some reason wont eat shrimp. It did eat some squid but circled and sniffed at it forever. I finally just left the room and when I came back it was gone. It wont touch frozen/thawed out smelt even though it is a whole intact fish or tilapia pieces for that matter. Love the change of pace with my little Suvattii that eats everything.